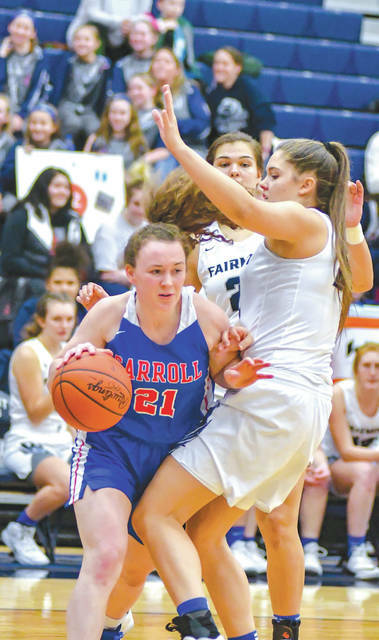 Chris Greene | Greene County News Greene County area schools Carroll, Cedarville and Legacy Christian Academy emerged as the top seeds from the county for the 2019 sectional basketball tournaments. Liz Bush (21) and Carroll are the No. 1 seed in Division II, while Emily Riddle (10) and Legacy Christian; and Maggie Coe and Cedarville are both No. 2 seeds in Division IV. https://www.beavercreeknewscurrent.com/wp-content/uploads/sites/49/2019/02/web1_BushCarroll_PS.jpgChris Greene | Greene County News Greene County area schools Carroll, Cedarville and Legacy Christian Academy emerged as the top seeds from the county for the 2019 sectional basketball tournaments. Liz Bush (21) and Carroll are the No. 1 seed in Division II, while Emily Riddle (10) and Legacy Christian; and Maggie Coe and Cedarville are both No. 2 seeds in Division IV.